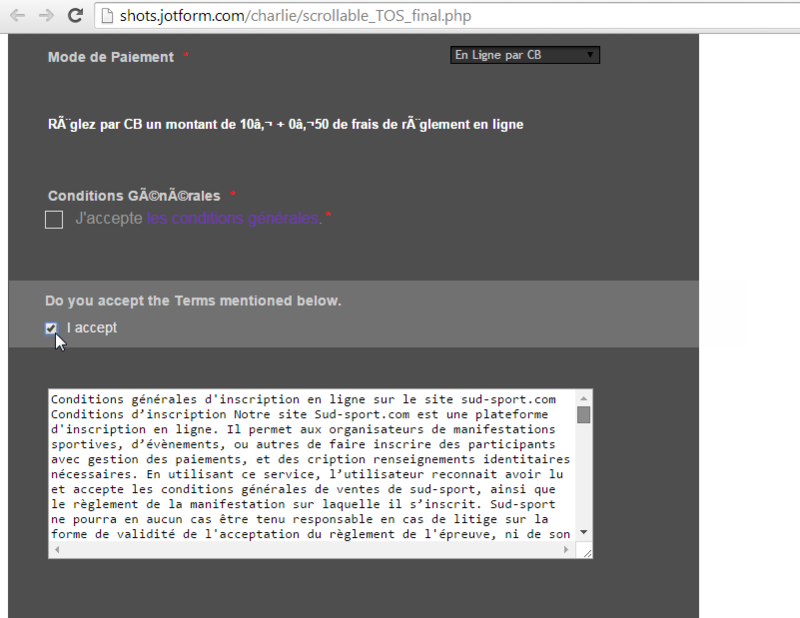 Than how can I force user to navigate through the end of the conditions before allowing him to tick the box "agree with terms and conditions"
I tried to apply your proposed solution to the widget but it doesn't seem to work, beside the fact that I think that an "Iframe" instrctuon only insert a page within a page not adressing my popup window requirement or I probably misunderstood your point. If tht's the case sorry for my thickness. If you would like to try it, please do send me the form's URL so that I can take a closer look. For the meantime, there's no other way to make the user aware that he/she needs to read or scroll the terms before proceeding. 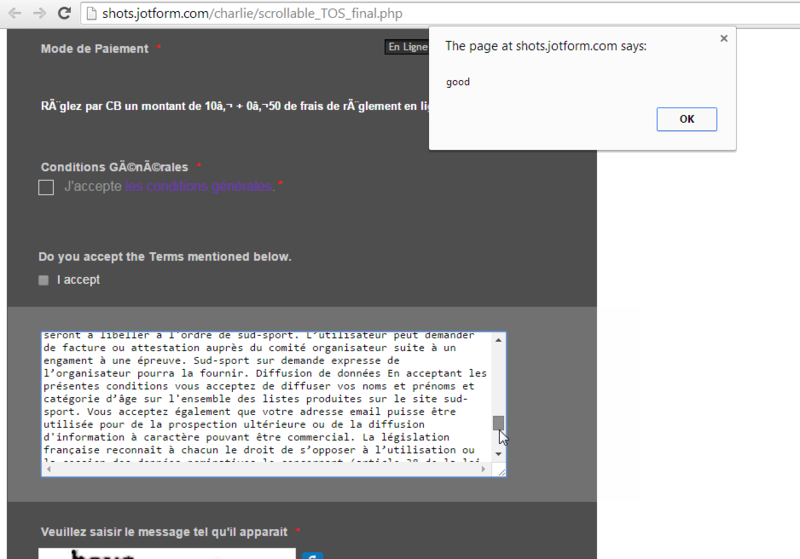 You came to the same conclusions as I tried to use custom javascripit my mimicking the form popup integration schema wihtout succes. I'l use your suggested solution. Thanks for you help and time, I do appreciate all the jotfomr support tema for there responsivness and expertise. Thank you for the compliments. 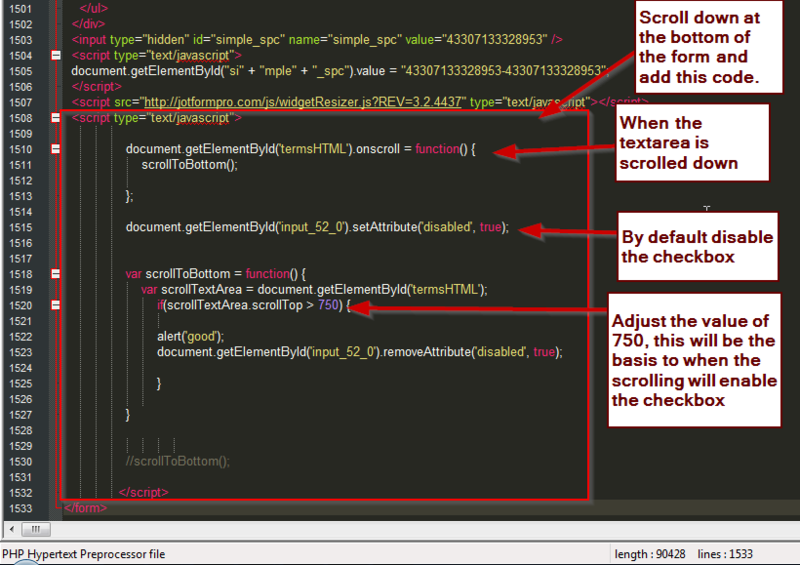 Here is the workaround that I have, you will need the source code and edit from there and embed it to your website. But, I will still escalate your request as a feature request, so that our developers can take a look at it and see if they can implement it directly to the widgets. Here is the guide for the workaround that I thought. 1. Instead of widgets, I used the default checkbox and the textarea for the Terms field. 2. Edit the name and value of the fields. 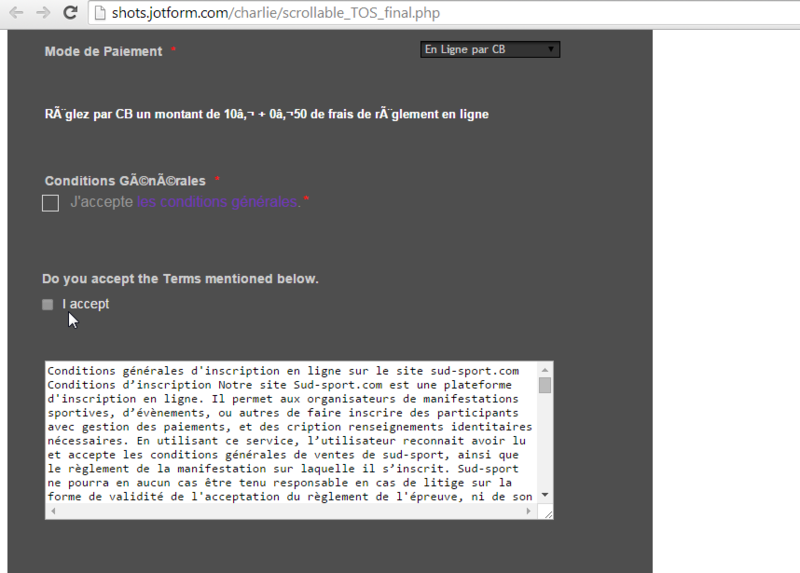 In my textarea, I added the terms that you have, but I also edited it in HTML. 3. 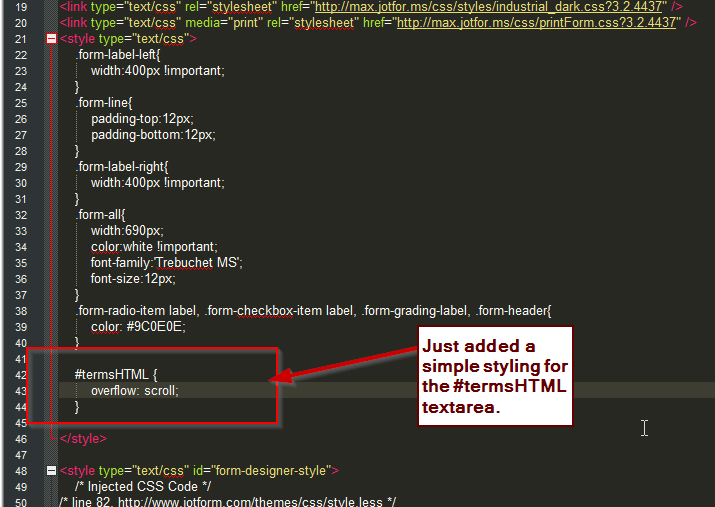 In the HTML editor of the textarea, I added "id=termsHTML" and change the cols and rows value. 4. After saving, I navigate to "Setup & Embed" and get the full source code. 5. Choose "Source Code" and copy the code there. 6. I then pasted the code to my text editor, in my case it's Notepad++. 7. 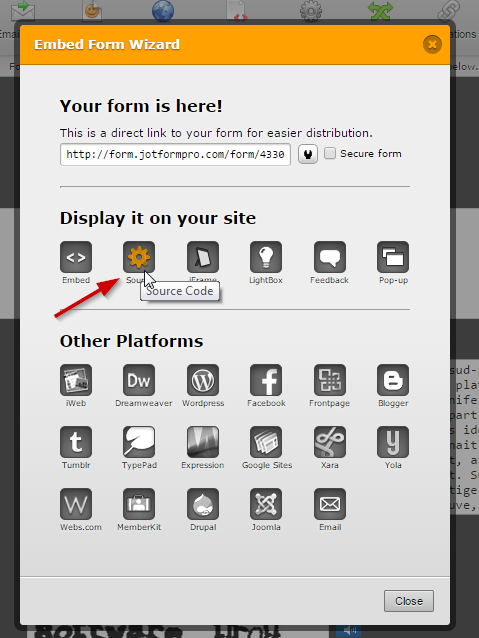 Next, scroll down at the bottom and add this code before the form ends. 8. I then embed the edited source code to my website or a webpage. 8.1 Unable to tick the checkbox. 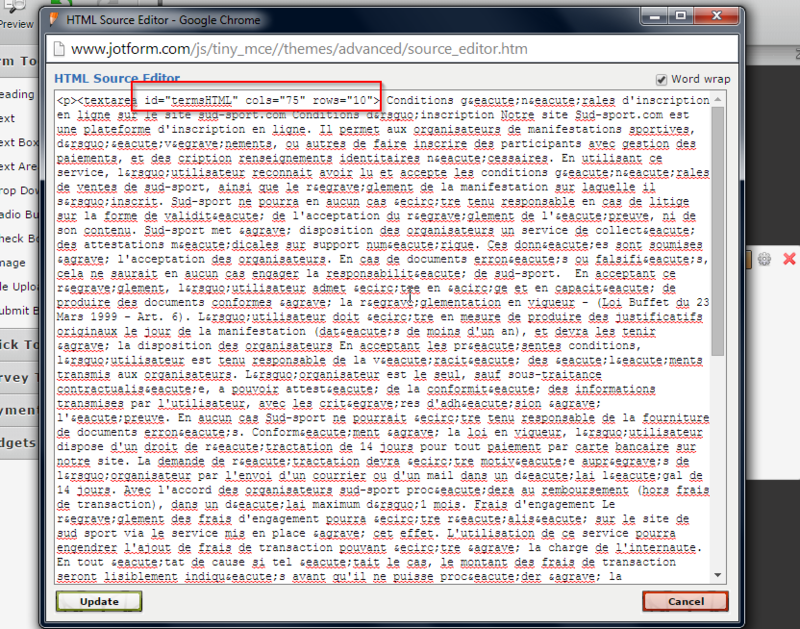 8.2 When you reach half or almost bottom of the terms an alert will show (this is just for code testing). 8.3 The checkbox will then be enabled and be available to tick. What that code does? The code by default disable the checkbox of "I accept..." field, the user then needs to scroll through the terms textarea and when he reaches the bottom or at least half of it, the checkbox will then be enabled. Please note: Please do check the IDs of each element, it may be different from yours. Aside from the workaround I provided above, I have escalated your concern as a feature request for the widget Scrollable Terms. Our developers and technical team will take a look at this, you will receive a notification when an update has been made regarding if it has been considered for implementation. Unfortunately, I'm unable to provide an ETA or expected date to when we can receive an update, but rest assure that this has been already brought up to them.